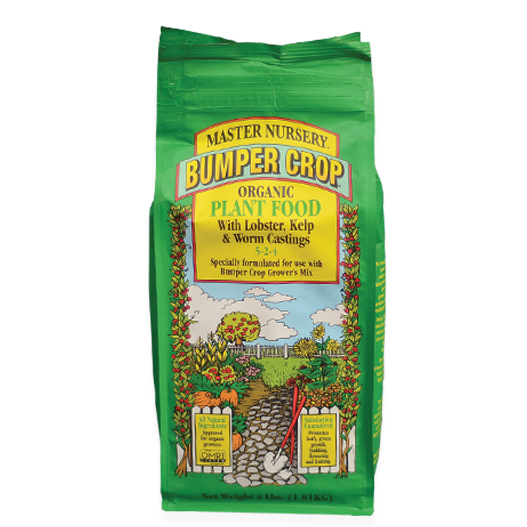 Made with lobster, crab, fish, and kelp meal plus worm castings and other important natural ingredients, this exceptional fertilizer will super charge the biological activity of your soil, giving all your plants a significant boost. It is also high in calcium (6%) and a range of macro and micro-nutrients to help improve plant vigor! Available in 4lb bags at selected retailers. Fill the container with a premium potting soil or professional growing mix. 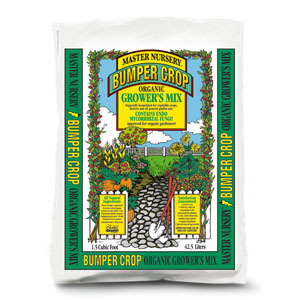 We recommend Master Nursery® Bumper Crop® Grower’s Mix for best results. Then, incorporate 1 teaspoon per 6″ diameter of container or 1 tablespoon per square foot of soil. If you are maintaining an existing container, first water thoroughly, allowing the water to be absorbed prior to feeding. Then work the plant food and a little compost (if available) carefully into the soil around your plants. 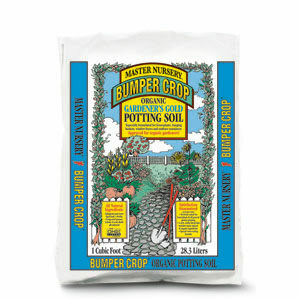 Mix 1 pound (3 cups) of plant food per 1 cubic foot bag of Master Nursery® Bumper Crop® Soil Builder. Apply at a rate of 1 cubic foot of compost per 5 square feet of garden in either the early spring or late fall. Work into the soil to a depth of 3 inches and water thoroughyl. 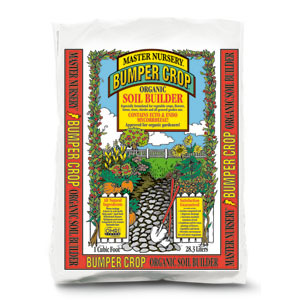 Combine 1 pound (or 3 cups) of plant food and 1 cubic foot of Master Nursery® Bumper Crop® Soil Builder per 10 square feet of garden as early in the season as possible after the last freeze. If your soil has already been amended with compost, just apply plant food at the same rate of 1 pound per 10 square feet of garden, again as early in the season as possible. Apply again in mid-season if needed. Produced by Coast of Maine Organic Products, Inc. 145 Newbury Street, Portland, Maine 04101 for Master Nursery Garden Centers, Inc.